Female hair loss is more common than you think, with over 40% of women seeing visible signs of hair loss from the age of 30. Many women are going to extreme lengths (pardon the pun!) to find a solution for their hair loss. 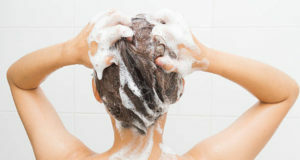 With so many so-called "fast hair growth shampoos" on the market we all want to know - does hair growth shampoo really work? What Are The So-Called Magic Hair Growth Shampoo Ingredients? You would have seen the recent proliferation of instafamous hair growth shampoos. These so-called wonder hair growth products claim they can cause hair to grow super fast while preventing breakage using simple organic, vegan friendly ingredients. Stinging Nettle Extract advertised as a natural DHT blocker is supposed to reduce hair loss, however as it's listed last on the list of ingredients, we can assume minimal amounts are included. No doubt not even close to a therapeutic quantity. The other ingredients in these shampoos, which are headlined to grow hair, include argan oil, castor oil, peppermint oil, horsetail extract and rosemary oil. After investigating all of these ingredients, we found there is very little scientific evidence of hair growth behind any of these oils. The natural oils including argan oil, horsetail extract and rosemary oil may contain minerals and vitamins which could nourish the hair, but there is no evidence that these cause hair to actually grow. The properties in these, and many other oils, could be good for repairing dry hair and preventing itchy scalps but again, certainly not for restoring hair follicles. In fact during our research we spoke with some manufacturers of hair oils, and discovered that argan oil is among the worst of the ingredients. It is a cheap low quality oil used as a filler and you find it in most of these current "fad" hair growth shampoos and oils. Let's face it, if there was a shampoo that could grow hair, there'd be no bald men! Unfortunately, with an abundance of products on the market offering hair loss cures, it's hard to know what's real and what isn't. But please beware, unless you use an FDA approved product like minoxidil, dormant hair follicles will not grow new hair. At best, hair products that contain essential oils can improve the overall health of the scalp. Yes, perhaps a good place to start, but hair growth shampoos will certainly not induce the growth of new hair. Nor will it induce faster hair growth. In fact, nothing can do that! So what of those amazing before and after photos of women who have supposedly grown 3 inches of hair in a matter of weeks, we hear you ask? Well, we will let you in on a little secret. Those photos are taken on the same day! Yes, the very same day. The longer hair photo was taken first, then the hair was cut and voila! The shorter hair photo was taken. Then they just switch them around so the photo taken after the hair was cut, becomes the "before" photo - sneaky huh? Please be on the look out for these scam products. Don't be swayed by their tens of thousands of likes and followers, they are done with internet robots. They don't have that many followers at all - probably a few hundred at best. And of course, all the reviews are arranged. They provide free product to anyone who is willing to fake a review. The internet, Facebook and Instagram are full of fake scams with supposed hair growth shampoos. Please don't waste your money. If you are experiencing more than usual hair loss, check with your health care professional. Medical professionals will offer advice based on your symptoms and may suggest solutions for your particular hair loss. Read more about hair loss causes here.